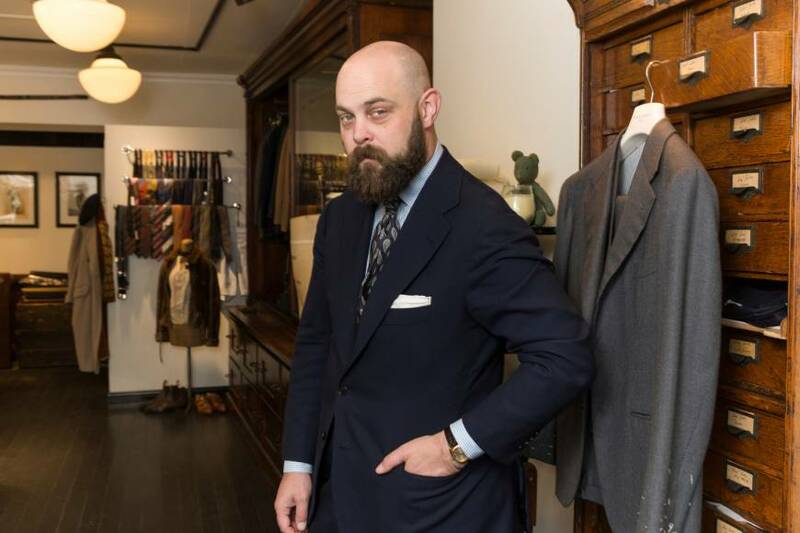 Ethan Newton, the 38-year-old proprietor of niche menswear boutique Bryceland’s and noted sartorialist, is putting me on notice. He is lounging on a sofa in a coffee shop in Tokyo’s Jingumae district, garbed head (Basco Roma beret) to toe (St. Crispin’s shoes), in bespoke finery. A double-breasted gray wool Martingala overcoat and navy wool suit from Liverano (Florence), Ascot Chang shirt (Hong Kong), Bryceland’s seven-fold tie and Simonnot Godard pocket square (France) complete the ensemble. As the promised strong opinions pour forth he seems the very embodiment of Gore Vidal’s definition of a stylish man: one who knows who he is, what he wants to say and doesn’t give a damn. Newton’s passion for his chosen profession pulses through our conversation as he describes, with frequent caustic asides and the occasional “off the record,” the quasi-philosophical approach to menswear he has developed from his early days in the suburbs of Sydney via the cut and thrust of the Hong Kong menswear market, and now to his own bespoke business in this chic little corner of Shibuya Ward. Newton grew up amongst immigrant communities whose strong cultural identities contrasted sharply with the more remote, almost liminal character of the Anglo-Celtic Australians. He spent his free time rummaging in secondhand shops in search of vintage militaria — an early and enduring obsession — and classic American workwear, of the sort witnessed in Steinbeckian images of dustbowl America, early signs of the aesthetics-led-by-function approach that would inform his whole outlook. A scholarship to study men’s tailoring led to jobs in the better menswear stores in Sydney, at one of which — Swell store — he had a eureka moment on discovering the Japanese brand Evisu. 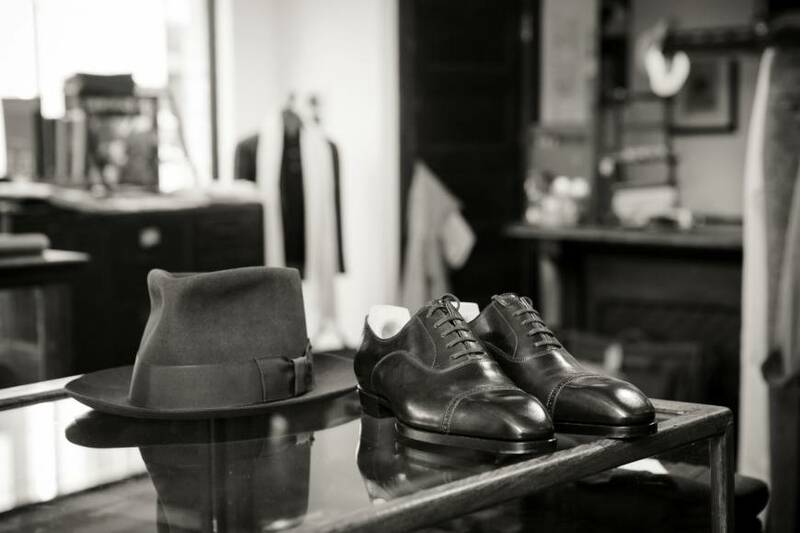 Later, after pursuing a girl to Tokyo, he visited the Evisu store in Daikanyama, and after a drunken night with its manager — the legendary Osakan Hidehiko Yamane, one of the big beasts of Japanese tailoring — Newton offered his services as an apprentice and was taken on. A move to Hong Kong saw him become in 2010 one of the three founders of The Armoury, now considered one of the world’s greatest menswear stores, where he worked as creative director. Then, talent-spotted by Ralph Lauren’s brother Jerry, he was, after a long courtship, seduced into joining the international fashion behemoth as an executive in charge of men’s luxury brands. Those strong opinions could not be easily contained within the corporate straitjacket, and the job lasted just a year. Despite the rare misstep, he retains affection for his old boss, with whom he would spend hours engaged in deep philosophical discussions. At the very least, the experience showed Newton what he didn’t want to be: “Living someone else’s dream,” as he puts it, was not a good look. He retains respect for the quality of the Ralph Lauren brand, but the cynicism of the corporate world in general, where every last drop of profit is squeezed from suppliers and customers, repelled him. He needed an alternative philosophy and found what he was looking for back in Tokyo: a vintage ready-to-wear option named sanpō-yōshi. Basically an Edo Period merchant’s code, sanpō-yōshi is a compact between the craftsman/retailer, the customer and, ultimately, society as a whole that sees respect paid and benefit accrued in three directions. It’s an ethical strategy that prioritizes quality, long-term relationships, fair pricing and, yes, happiness over short-term profits and permanent growth. But if the business ethics of traditional Japan attracted, the current state of men’s fashion here frequently appalls. Among a menagerie of pet hates, Newton is especially withering about what he calls the “feminization of menswear” in Japan, which sees men squeezing themselves into uncomfortable, fussily designed “gender-fluid” outfits, their true identities spilling out in the process. This anemic geekiness turns clothes, he explains, “into costumes,” and is the very opposite of the characterful nonchalance and classic elegance Newton sees as crucial to a well-dressed man. 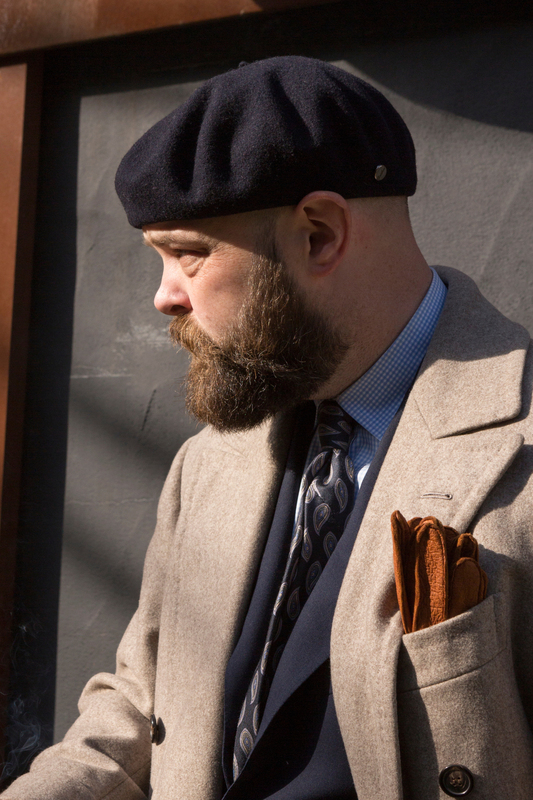 Bryceland’s Tailors is a short walk, but a world away in terms of style, from the Sodom and Gomorrah of fast fashion and brand-name soullessness of Harajuku and Omotesando. It has more the feel of a one-room museum than a clothes shop, with exhibits rather than merchandise. Each item in the carefully curated collection has a back story and personality of its own. 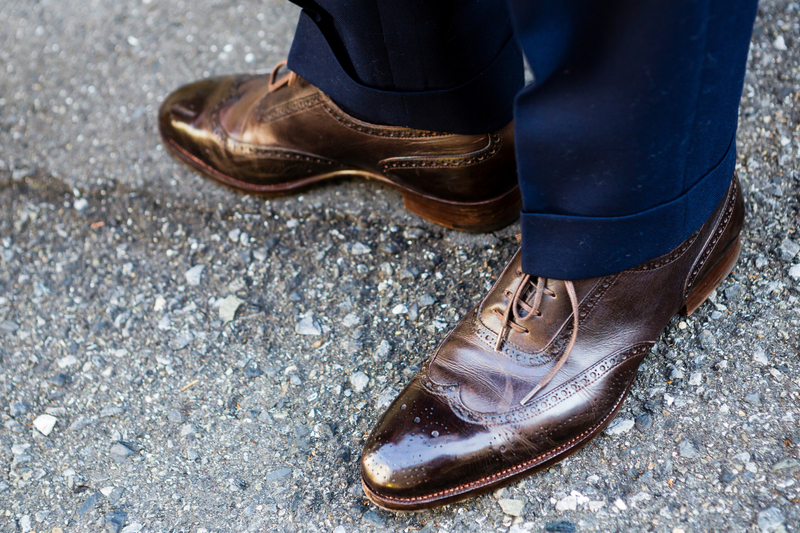 Newton is happy to describe the provenance of each piece, many of which are made to exclusive Bryceland’s designs. The golden age of Hollywood is an obvious reference point, and there’s an almost Hitchcockian feel to the room. Indeed, “Rope” is one of Newton’s favorite films, which makes me wonder for a second if there might not be a body concealed here in one of the cabinets — of a skinny-jeaned Harajuku hipster perhaps? I ask about his style heroes. It’s the shortest answer of the interview. 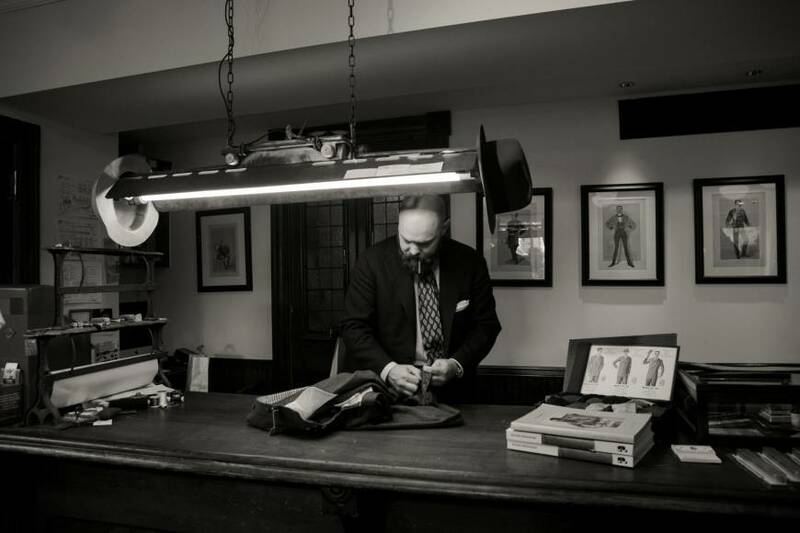 Newton explains that Bryceland’s is essentially a “custom shop,” a place where men can pick up “peripheral product” while waiting for their bespoke pieces to be finished by the in-house tailor. 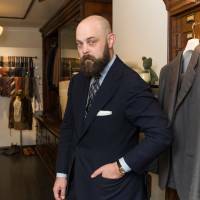 Customers are encouraged to drop by for a coffee, or a whisky, and a chat, and the shop is fast becoming a hub for like-minded style-conscious Tokyoites, including designers and craftsmen such as tie maker Kenji Kaga, shoemaker Yohei Fukuda and arguably Japan’s best-dressed man, Yukio Akamine. The sanpō-yōshi philosophy charts progress in terms of depth, rather than breadth — and there are no plans for expansion. “I want to keep the operation small and nimble. My ultimate goal is for my customers to bring their children in to have their clothes made,” he explains. Ethan Newton — knows who he is, what he wants to say and doesn’t give a damn. 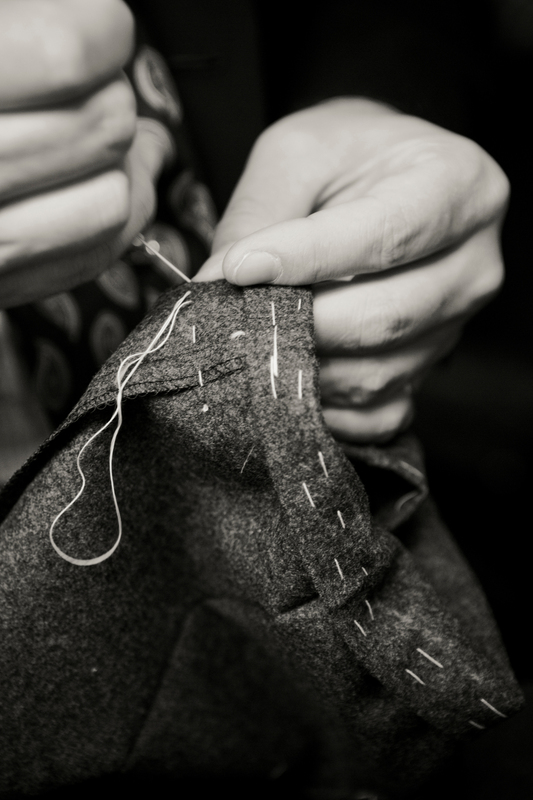 Bryceland’s Tailors: www.brycelandsco.com. Send your comments and Community story ideas to community@japantimes.co.jp.